www.sikkimpolice.nic.in website. Last date to reach the filled application form for these Sikkim Police Constable Executive jobs is 12-12-2018. Candidates selection will be based on physical tests (PET/PST) and written exam for this Sikkim Police Constable (Male/Female) Executive Jobs. For Ex Serviceman ESM 10% Constable posts are reserved. More information about this Delhi Police Constable Executive recruitment in Sikkim state post wise vacancies, age limits, qualification, application form and other info is given below. There are total 65 posts in this Sikkim Police Constable (Male/Female) Executive recruitment of Delhi Police. 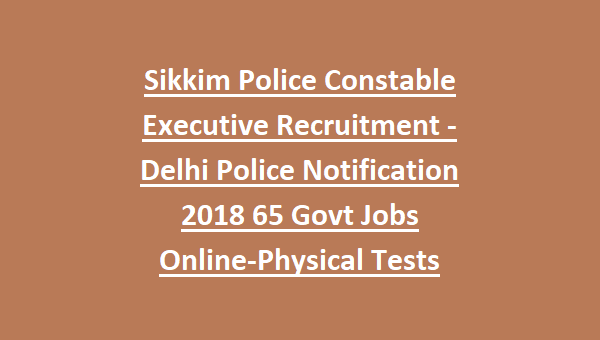 Sikkim state candidates only eligible for applying these Delhi Police Constable jobs recruitment 2018. For Male candidates as on 01-07-2018 age limits are 18-21 years. For Female candidates age limits are 18-25 years. For OBC candidates 3 years and for BL/SC/ST/Primitive Tribe candidates 5 years of upper age relaxation is given. 10+2 (Senior Secondary Certificate) qualification is required. Application fee is Rs.300/-. DD to be taken in favor of DCP/Recruitment Cell, New Police Lines, Delhi (Payable at Delhi). No fee for exempted for BL/SC/ST/Primitive Tribe, Female candidates and Ex-servicemen. 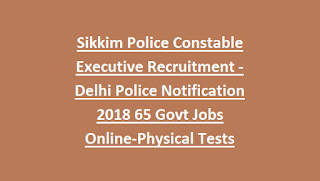 Candidates selection for this Constable jobs in Sikkim Cadre Delhi Police will be held based on physical standards tests PST, physical efficiency tests PET and written exam. Candidates can download application form from www.sikkimpolice.nic.in website. Submit the application form by hand or through ordinary post to below given address. Candidates will receive the admit card before Jan-2019.